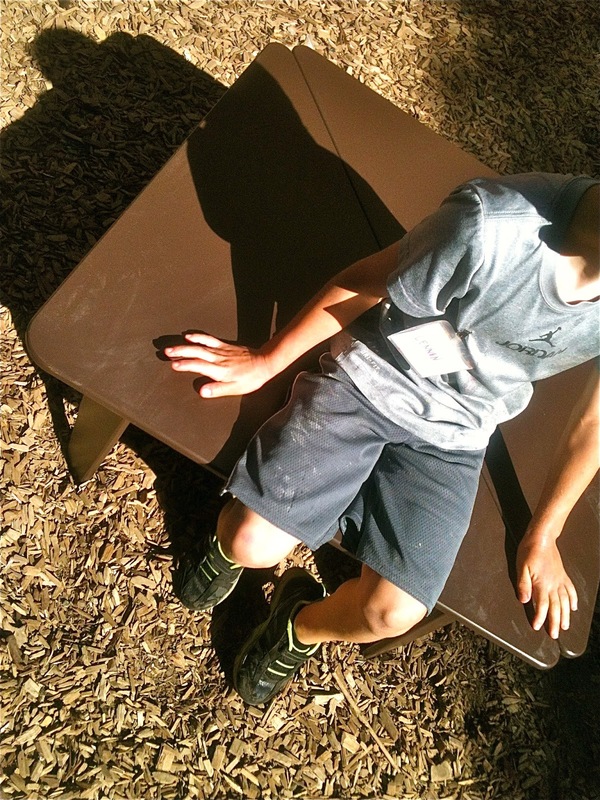 In yesterday's post I mentioned that the kids in our summer program spent last week assembling our new outdoor furniture. We could have afforded to purchase the "velvet glove" service which would have meant the stuff arrived fully assembled, but where's the education in that? Adults often have to hold things in place as the kids tighten the screws. It's a real collaborative process. I've found that assemble-yourself furniture, such as the stuff you get from places like Ikea, is a sort of "just right" project for our cooperative preschool. 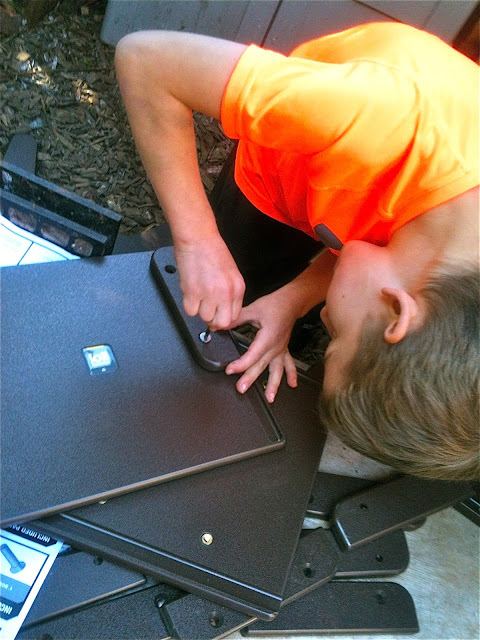 Naturally, we can't just turn it over to the kids, but with an adult or two leading these Allen wrench (hex key) assemblies, kids as young as two are capable of making meaningful contributions to these real life projects. Concentration, cooperation, and fine motor skills are challenged. It never seems like it's going to work at first. 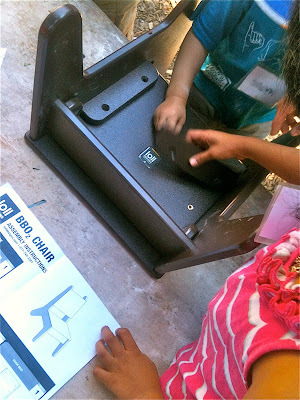 We open the boxes and always seem to find more parts than you think you'll need, and the instructions look daunting, especially since there is often a crowd of kids trying to get there hands on things. The first step, however, is a classic preschool sorting project, checking the instructions to make sure you have all the parts, arranging everything by type and shape, comparing the thing you're holding your hand with the graphic on paper, counting out the various screws. These are skills and habits we acquire when we're young that we use throughout our lives. Once this is accomplished, we know the names of the parts, and naming things always makes projects seem a little more do-able. For instance, the kids and parent-teachers started using the term "lozenges" to label one of the basic pieces required to assemble these chairs, stools, and tables. I don't know if that came from the instructions or their own innovative use of language, but it stuck. "I need a lozenge!" "I found a spot for a lozenge!" We then find Step 1 in the instructions. It's really remarkable how often it's the kids who figure it out first. Then on to Step 2 and Step 3 and Step 4. This isn't for every child, but for some it comes naturally, this kind of real world puzzling. Here we are fitting a "lozenge" into its proper place. There's usually an ebb and flow at the workbench as kids take and lose interest. There are always a few who want to see at least one project through from beginning to end, however, puffing their chests in pride when the finished piece is on the ground. 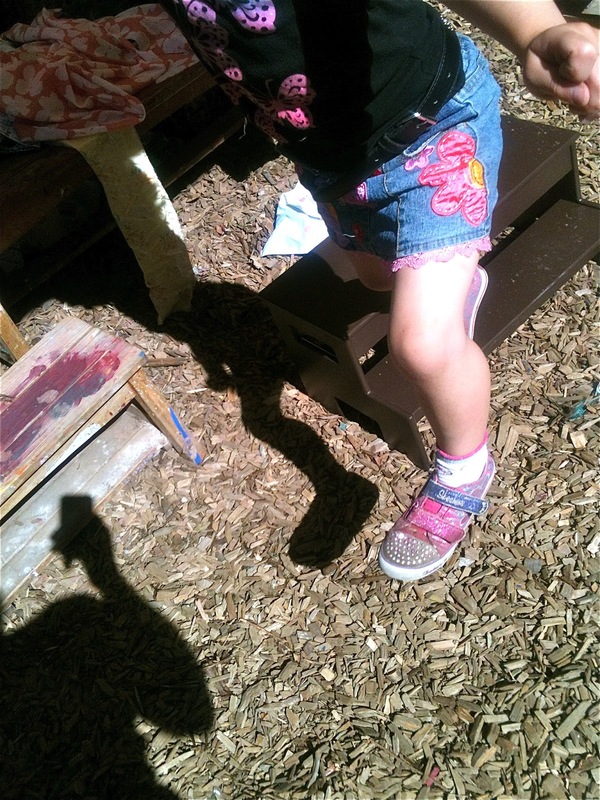 The first piece we finished was this step stool, which we'll also use to replace our old, wobbly benches. And, of course, once we finish building a piece, we have to take turns putting it through its paces. Assembling furniture like this is different than much of what we do in our preschool in that it is a project with a predetermined beginning, middle, and end, much like working on puzzles. Over the course of our three days working on this project, at least six different parent-teachers took turns, and I suspect that at one time or another, every child lent a hand. One of the most challenging parts for the adults, however, was in not becoming too product-oriented, too focused on "getting it done." I kept reminding everyone: "It's not a race. If we only get one piece done today, that's fine." One of the concerns, especially with our wood chip bestrewn outdoor play surface is that with all those little hands, and all those little agendas, we would wind up losing some of the small, but all-important screws. And it was a real concern given that, like with most of these kinds of products, we weren't provided any extras. I was impressed with how seriously the children, even the very youngest, took this responsibility, often clenching them in their fists so securely that their palms were sweating when we finally pried them open. Real world projects like helping with preparing dinner or working on the car, in which children can make a meaningful (rather than a manufactured) contribution are great for building skills and confidence, of course, but most importantly, I think, it fosters that sense of pride and responsibility, that sense of true belonging that lies at the heart of every great community. Note: I will be traveling to and around Australia and New Zealand for the next three weeks or so. I'm hoping to continue posting, but don't be alarmed if I miss a day here or there.